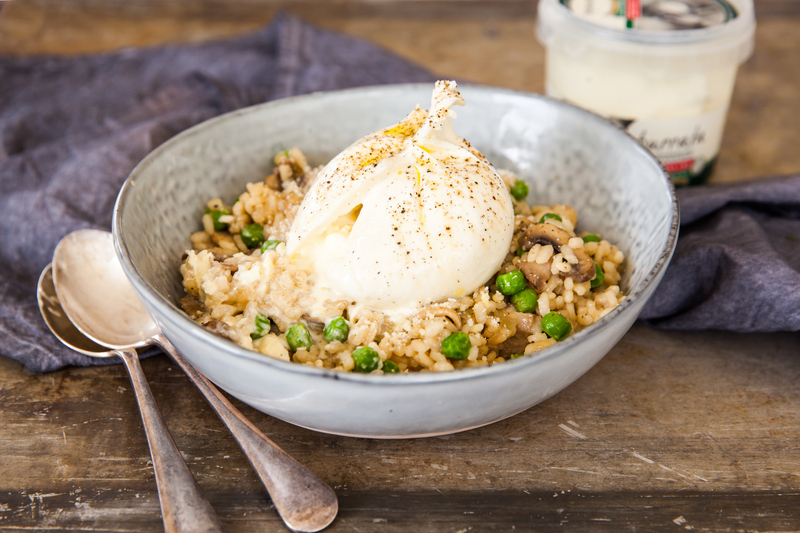 Marisa’s simple recipe for a delicious risotto, made extra special with the addition of a plump, cream-filled Burrata on top! 1 Heat oil in a heavy based saucepan. Add chopped onion and garlic and stir occasionally. Sauté until soft and translucent. 2 Add the sliced mushrooms and cook slightly. Next add the rice and stir for 1-2 minutes until coated with oil. 3 Gradually pour in one cup of stock at a time until slightly absorbed. Continue until all stock is used. Cook for 20-25 minutes, stirring frequently, until rice is tender. 4 Stir through peas and some Grated Parmesan. Remove from heat and transfer to a serving dish. Place the Burrata on top and sprinkle with Grated Parmesan. Slice Burrata open over the Risotto and cut it into portions. Serve immediately.